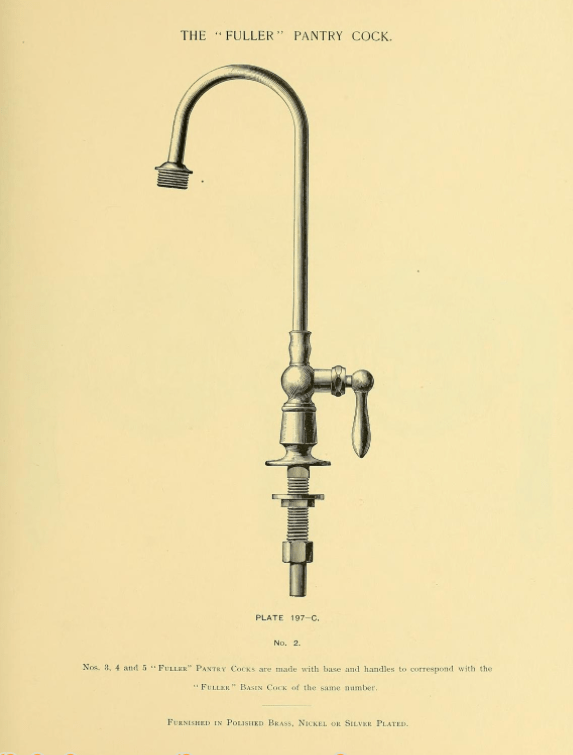 In my previous post, I asked a question which, I have no doubt, is a question, well, everybody wonders about: WHAT does a period-correct faucet look like for an 1894 butler’s pantry? And today, thanks to the magical Bo Sullivan, everybody has an answer! Now, if Bo could also quickly come up with an answer to repair the insanity of the current presidential race, I, and many others, will rest easier. 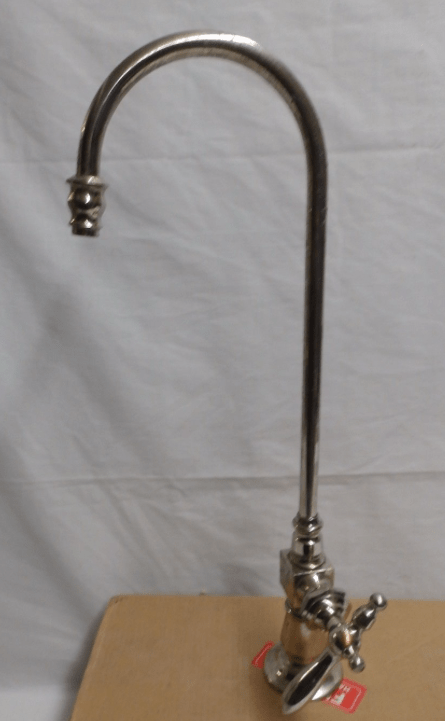 A vintage gooseneck faucet. The seller states 1880s. Kristin just sent me a link to this AMAZING pair of faucets! Not goosenecks, and way too fancy for the butler’s pantry, but wow! Thanks, Kristin! Yesterday, it never occurred to me that the missing pantry faucets were likely of the gooseneck type. And of course this makes sense with the small, shallow sink. Now, I am on the hunt for vintage gooseneck faucets! 9 Responses to Ahhhhh! A period-correct faucet! I don’t know. Why would anybody attempt to, say, fill a tall pot in the butler’s pantry instead of the kitchen? I should think this sink was more likely used for hand-washing, quick rinsing of dirtied napkins and moistening cleaning cloths for table service. Also, the amount of splashing would be far greater with gooseneck faucets. The presence of the drainboard does seem to indicate that some washing of service items was done at this sink, but I would be surprised if it included anything larger than a teapot. I am guessing that fine glassware and fine china was washed (or at least rinsed) in the butler’s pantry. To do so, gooseneck faucets would have been required. Otherwise, the sink is so shallow that there would not have been enough room to properly clean a tall glass. Also, the image Bo supplied is identified as a pantry faucet. I belive all the crystal glassware and china was stored in the butler’s pantry, and the built-in china cabinet in the dining room. There is also a locked cabinet for silverware. Any news on the screen doors? I am as breathless with anticipation as you! Those other decorative faucets are something special – acquire if you can for a bathroom. I’ve never seen anything like them. Interestingly, the decorative treatment of the various areas of metal manufacture – silver, lighting, hardware, etc. – rarely seemed to share “cross-fertilization” of recognizable patterns. Even when they did share a motif – like Repousse for example – the silver was different from the lighting was different from the hardware. 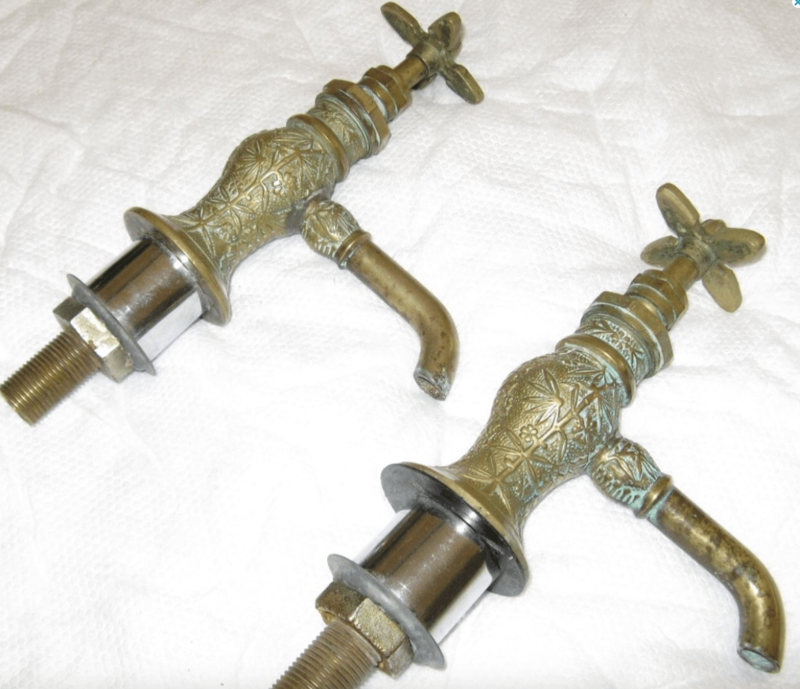 What is striking about those faucets, and not something I have ever seen before, is that they look A LOT like a very popular 1880s Aesthetic Movement motif called “Oriental” from Branford Lock Works, distinguished by that particular bamboo treatment. 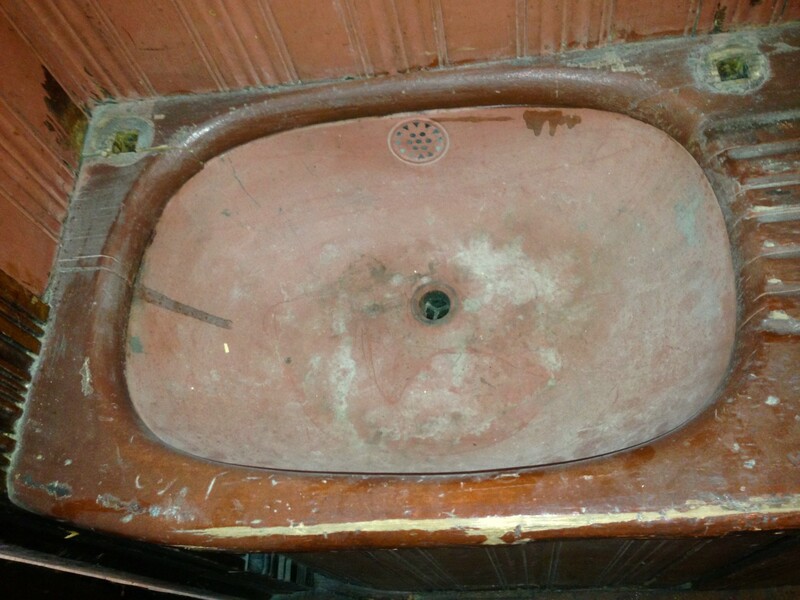 I’d guess those faucets are mid-to-late 1880s, though Oriental remained popular almost up to 1900. It will be great to see that room done. There is such a lot of good building fabric there! The Wolff catalogs are excellent references, as Wolff was one of the better-quality companies.